Chicago's restaurant scene has been awfully busy over the past few months. Opening after opening, we've been impressed with the newcomers, but these four restaurants keep us coming back again and again. Mi Tocaya Antojería: Plenty of new Mexican restaurants opened their doors this year, but Mi Tocaya is one to watch. The tacos are the main attraction, including the spicy Campechano stuffed with al pastor, chorizo and carne asada and garnished with salsa and a squeeze of lime. Pair your order with a reposado tequila margarita, an easy summer sipper. But the best part of dining here is the open kitchen, where you’ll spot chef Diana Davila crafting unique regional specialties. Ella Elli: The newest spot from 4 Star Restaurant Group pairs friendly service with beautiful plates in cozy digs. Grab a bench at the bar (that’s right, there are tall, two-seat benches practically made for couples) and order a round of cocktails. We’re particularly fond of the gimlet with gin, lime cordial and elderflower liqueur. Opt for dishes like a creamy confit potato with pickled mustard seeds and dill. This surprisingly elegant spot makes the perfect backdrop for date night. 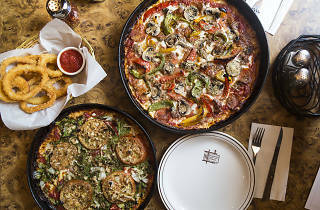 Burt's Place: Every Chicagoan has a favorite deep-dish pizza—and will defend that choice until the bitter end. If you’re still searching for yours, consider Burt’s Place in Morton Grove, Illinois. After closing nearly two years ago, the iconic pizza parlor reopened earlier this year, much to the delight of its longtime fans. Burt’s still takes phone orders ahead of time (highly recommended), but it has done a gut rehab of the building, adding a bar with several draft taps. Of course, you can also take your chances as a walk-in, but be prepared to wait. 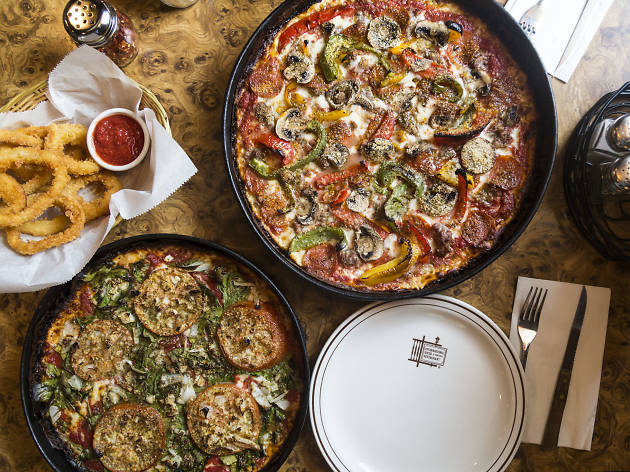 From the city, a relatively quick Metra ride will get you there in a jiffy, making Burt’s a must on any pizza lover’s deep-dish checklist. The Ruin Daily: The team behind Dusek’s and Saint Lou’s Assembly is here to make your lunch hour a little sweeter (and boozier). The bright, airy shop opens early with coffee and pastries for morning commuters before transitioning to sandwiches and adult beverages for the lunchtime crowd. Diners will find funky and classic sandwich options detailed on a roll of brown paper mounted to the wall, including a salmon po’ boy with creamy special sauce and pickles or a stacked Reuben on rye. For something extra, grab light sides (such as pickles and potato salad) from the fridge to compliment your sandwich. You can also spice up your lunch routine with a cocktail; we liked the Barracuda, a summery pineapple-heavy rum drink.